Every year the Longwood Rotary Club, in partnership with Kennett Area Community Service and LCH, purchases backpacks, school supplies and new books for needy children in our community. In 2017, we supported over 375 children from Kindergarten through 12th grade! Every year we attempt to increase our support, because we know there are well over 700 children living in families that meet federal poverty guidelines in the Kennett Square area. I am not able to solve all the economic challenges for those families, but I know that children who value education are destined for a better life and will lead to a stronger country. Providing the school supplies these children need helps prepare them to learn and to enjoy school. My request to you: This year when you are shopping for your children’s school supplies, please purchase additional school supplies for children in the greatest need in our community. Let your children help out and make it game to purchase the “loss leader” promotional items that most stores offer each week. It can be surprisingly fun to buy 15 cent folders and 25 cent spiral notebooks! If you happen to be a Costco member consider buying a High Sierra backpack for the sale price of only $16 during the month of July, which is a fantastic deal and will make any child who gets it happy! Most importantly, talk with your children about the value of helping the less fortunate succeed in school and showing them you care. You can drop off supplies at KACS, LCH, or any of the Unionville Chadds Ford schools. Another way to support our cause is making a tax-deductible contribution to the Longwood Rotary Foundation (P.O. Box 781 Kennett Square PA 19348 – add “Backpack Project” to memo). We purchase our school supplies on a wholesale basis from vendors who give discounts to non-profit organizations. 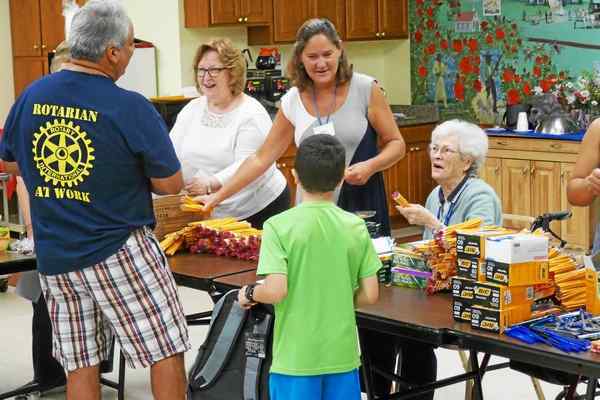 We partner with the Kennett Area Senior Center to assemble age-appropriate supplies in August to distribute to students before school starts. If you have any questions about this project or would like your family to participate in the assembly process, please send me an email (jgushurst@hotmail.com). Enjoy the rest of your summer! Jordan Gushurst is Co-Chair of the Longwood Rotary Backpack Project.